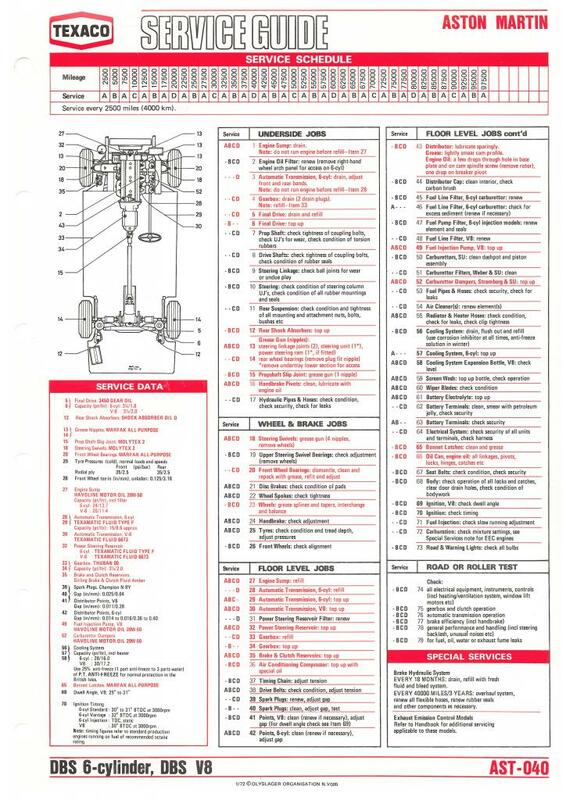 This one page document printed on cardboard-backed paper was published by the Texaco oil company in January 1972 and is a service guide for the Aston Martin 6 cylinder and V8 cars. It lists the periodical service operations to be carried out on both vehicles from new. This now extremely rare document acted as a publicity tool for Texaco as it was sent to Aston dealers to be hung in their workshops where DBS 6 cylinder and V8 cars were repaired and serviced. Texaco was the manufacturer of the oils and lubricants commercialised under the brand names of Havoline, Molytex, Texamatic and Thuban which it recommended for use in Aston Martin cars.